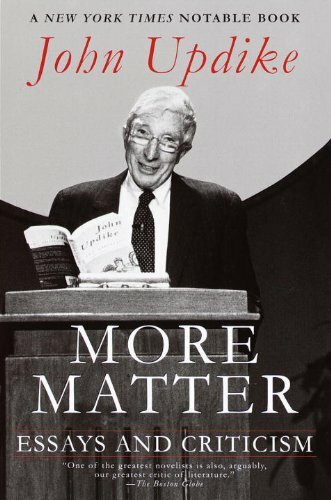 More Matter is a collection of essays and criticism from the 1990s. The bulk of the text addresses literature, but Updike touches other topics, such as art, movies, and politics. This doorstop of a book reaches 900 pages with several to spare, but nowhere in this entire tome do I ever feel that Updike is padding his writing, or going through the motions, or falling from his horse Pegasus, losing inspiration and writing mediocre sentences. That just doesn't happen with Updike. Instead, I wonder how he mashed all these wonderful thoughts into fewer than 1,000 pages. One gets the impression he probably left things out, that the book could have been even longer if needed. What impresses me about Updike is the density of his prose, his unique and imaginative turns of phrase in virtually every paragraph he ever wrote. I've tried writing like Updike myself, but I become exhausted after a few paragraphs. I don’t suppose many writers will ever be accused to mimicking him. He has something interesting to say about everyone and everything and possesses the knack of uncovering any writer’s weak and strong points. I feel as if he is revealing to me literary secrets no one else has discovered. And I never feel as if he’s wrong, or faking it. No, he hits the bullseye every time. “I set out to be a magazine writer,” he wrote in the Preface, “a wordsmith...and I like to see my name in what they used to call ‘hard type.’” Updike will be remembered foremostly as a writer of novels, but his large corpus of stories, essays, and poems will remind future readers that he was one of the last of the well-rounded literary men who could and did write brilliantly in so many genres. He never won the Nobel Prize, despite his consensus ranking as one of the most influential and respected literary men of the 20th century. Someone said his industrious production worked against him. A great writer couldn't possibly produce so much, was the prevailing attitude about it. I am wondering now if a handful of celebrated authors didn't write fewer pages in their entire careers than Updike in this single book. Picking any page at random, I find Updike expounding in a fascinating manner on a topic I had hardly ever considered. All his essays are like that.